NMW naming & shaming: frying the small fry? Between them, the companies named owe workers over £162,000 in arrears, and span sectors including fashion, publishing, hospitality, health and fitness, automotive, care, and retail. This latest round brings the total number of companies named and shamed under the new regime to 210 employers, with total arrears of over £635,000 and total penalties of over £248,000. With this sixth round of naming & shaming coming just four weeks after the last one (of 70 employers, on 24 February), and just two months after the one before that (of 37 employers, on 15 January), it’s clear that the rebooted regime that came into force in October 2013 has finally ground up through the gears to reach full speed. And, were there not a general election on 7 May, we could expect this pattern of monthly BIS press releases, each naming some 50 employers, to continue from now on. Accordingly, now seems a good time to take stock of what has been achieved to date, and what that tells us about HMRC’s enforcement of the NMW more generally. So I’ve been crunching the numbers. Perhaps the most striking – and significant – aspect of my number crunching is that the numbers are pretty small. Although the 210 named & shamed employers between them owed a total of £638,100 to a total of 5,396 workers, some 72 per cent (3,863) of those workers were underpaid by the three worst-offending employers (in terms of number of workers underpaid, though not necessarily the total or average arrears owed). In 121 (58 per cent) of cases, the employer had underpaid just one worker, and only in 12 cases had the employer underpaid 20 or more workers. Similarly, in 180 (86 per cent) of cases, the total arrears owed by the employer was less than £5,000, and only five employers owed total arrears of more than £20,000 (the current maximum penalty imposed by HMRC in addition to payment of the arrears owed, which is otherwise set at 100% of the total arrears owed). Even more strikingly, overall, the average arrears owed per worker was just £118.25, or just 0.6 per cent of the new maximum penalty of £20,000 per worker provided for in the Small Business, Enterprise & Employment Bill, on the verge of receiving Royal Assent. Indeed, only 30 employers (14 per cent) owed arrears of more than £2,000 per worker, and only two employers owed arrears of more than £10,000 per worker (NB in both cases, there was only one underpaid worker). In most cases, the sum owed per worker was relatively small: 104 of the 210 employers owed arrears of less than £500 per worker. 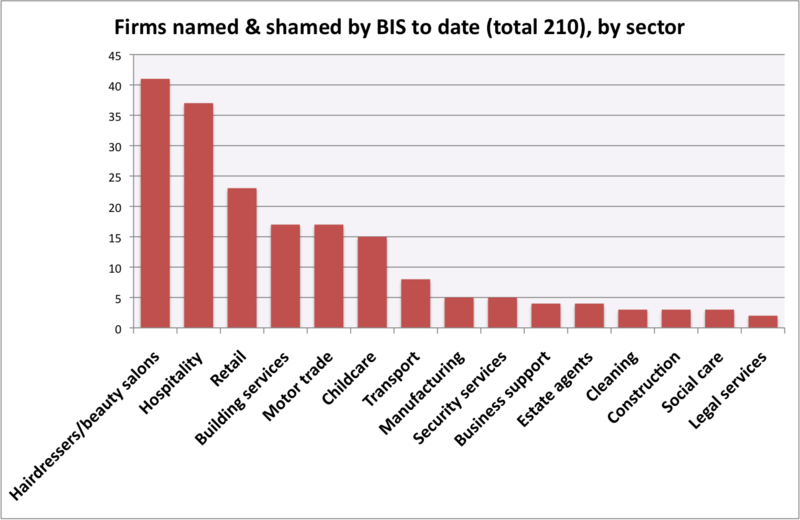 The impression that HMRC’s enforcement net is catching mostly small fry is reinforced when we breakdown the 210 employers by sector. From the following chart (which shows only those sectors with two or more of the 210 employers), we can see that 41 – almost one in five – of the 210 employers are hairdressers or beauty salons, and 37 (18 per cent) are a pub, restaurant, cafe or hotel. Only three care homes or home care firms have been named & shamed to date, and in those three cases the arrears owed per worker were just £178.76, £162.81, and £87.68 respectively. Yet, as noted previously, there is broad agreement that at least 200,000 of the social care sector’s 1.5 million workers are unlawfully paid below the NMW. Yes, there are a few household names among the 210, including (in this week’s round) French Connection UK, Foot Locker, 99p Stores, Pizza Hut, and Bounty (UK) Ltd, which produces the ‘Bounty Packs’ handed out to new mothers. But most such cases appear to involve what Jo Swinson calls “irresponsible mistakes”, rather than the employer “wilfully breaking the law”. French Connection, for example, owed an average of £44.78 to 367 workers, while fellow high street fashion retailer H&M owed an average of just £4.82 to 540 workers. All in all, the detail behind the headline numbers suggests that whoever has Ms Swinson’s job after 7 May should do rather more than simply decide whether to continue with the monthly BIS naming & shaming press releases. It’s time that HMRC’s enforcement net started catching some of the bigger (and nastier) fish in Britain’s minimum wage rogue lake, as well as the small fry. And that may well require new priorities, new strategies, and (even more) new money. I’ve been thinking about these figures and particularly the criticism – in the early days – that HMRC were going after “small fry”. It doesn’t surprise me at all that the main culprits are small businesses which either are ignorant of the rules or deliberately try to flout them. Bigger organisations, especially those with household names, have access to HR advice and are unlikely to want to risk the reputational damage that being named and shamed would create. However, those that operate Franchise models (I think Pizza Hut are named in the current batch) probably do need to ensure that their franchisees are better advised, since they are in effect operating as a number of small businesses – I would guess the same reason is the explanation behind the high numbers of hospitality companies cited. However, the focus of enforcement policy by HMRC – and this has been strengthened over the past few years – has been to ensure that all people who should be paid the NMW should be paid it and, if possible, get their money quicker. To the worker it does not matter whether the under-payment is due to mistake or malice. All complaints to the HMRC are followed up and there is pressure on the HMRC to deal with the complaints quicker. Though of course there is always still more to do. Of course there are examples where there will be major exploitation of workers by gross underpayments of the NMW. And there has been extra scrutiny of this issue in order to try to identify this gross exploitation. However, the assessment of this blog that there is little evidence of large scale under-payment of the NMW is in line with what I think is the overall assessment of compliance. Compliance is high and non-compliance in terms of financial amounts is generally more small scale.